The star of Red Dead Redemption says the success of games like his, and God of War, proves that there's still life in single player games. In recent years online shooters like Fortnite, Apex Legends and PubG have dominated gaming, and often headlines too. They're played online, with up to 99 other people. 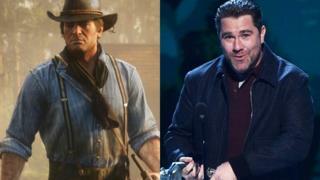 But Roger Clark, the voice of Red Dead's Arthur Morgan says there's room for both. "The storytelling potential - every year we see something more and more inspiring and brave - and I for one am a huge fan of single-player. "I'm going to be doing it until the day I die. I know it," Roger Clark tells BBC Radio 1 Newsbeat. The game had sales of $725m (£550m) in its opening weekend, according to Rockstar - which it called the "biggest opening weekend in the history of entertainment". "It seems like we were right, there's plenty of room for both," he says. Roger says that a game's online offering is a "huge, huge part of the businesses now" and says there were periods when Red Dead Redemption 2 makers Rockstar doubted what they were creating. "But at the same time there was a lot of commitment and we wanted to tell the best story that we could." Red Dead Redemption was nominated (but didn't win) in six categories at this year's Bafta Games Awards. But single-player, story-led games such as God of War, The Return of the Obra Dinn and mobile game Florence reaped the awards. God of War won the night's biggest prize. That game's director, Cory Barlog, told the BBC that God of War winning Best Game shows that story-based games are "just as relevant" as the Battle Royale genre. "I think there's a space for everything," he says. He says the game's success - and its Bafta win - means the pressure to deliver another compelling game and story was now extremely high. "We had very low expectations of this last one," he tells us. "Nobody really expected what we were doing - now everybody expects it, so I have a lot of thinking to do."